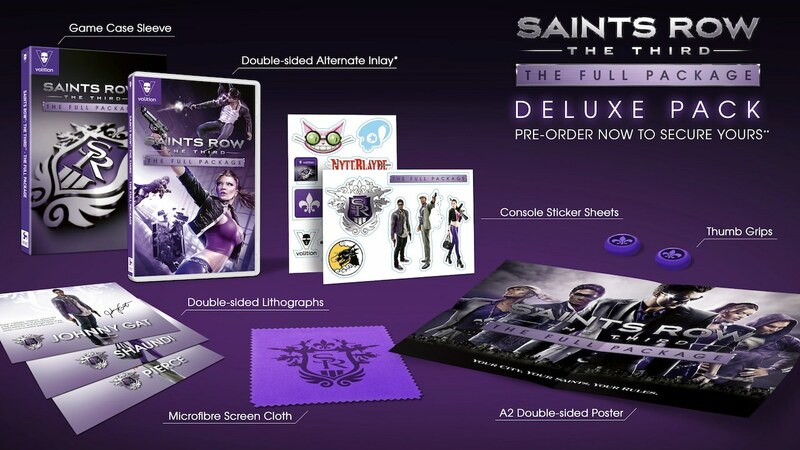 GAME has revealed that those who pre-order Saints Row: The Third – The Full Package on Nintendo Switch will receive a Deluxe Pack, exclusive to the specialist retailer in the United Kingdom. This bonus pack will be made available in “very limited” quantities worldwide and comes with a game case sleeve, double-sided alternate inlay, double-sided lithographs, microfibre screen cloth, console sticker sheets, thumb grips, and an A2 double-sided poster. Originally released for PlayStation 3, Xbox 360 and PC in 2011, Saints Row: The Third – The Full Package marks the first time that the Saints Row series has appeared on a Nintendo platform. Deep Silver Fishlabs has handled the port, with the game having originally been developed by Volition. After the Third Street Saints take Stilwater for their own, they have evolved from a street gang to a household brand name. Their celebrity status has not gone unnoticed and soon sees the Syndicate, a legendary criminal fraternity, demand tribute. Refusing to bend the knee to the Syndicate, you take the fight to Steelport, a once-proud metropolis that has been reduced to a struggling city of sin under Syndicate control. With all downloadable content thrown in, Saints Row: The Third – The Full Package will come with the Genkibowl VII, Gangstas In Space, and The Trouble With Clones mission packs, and 30 bonus items. Saints Row: The Third – The Full Package will release for Nintendo Switch worldwide on May 10th.